We were delighted to welcome approximately 200 members of United Synagogue Youth to the Museum today. 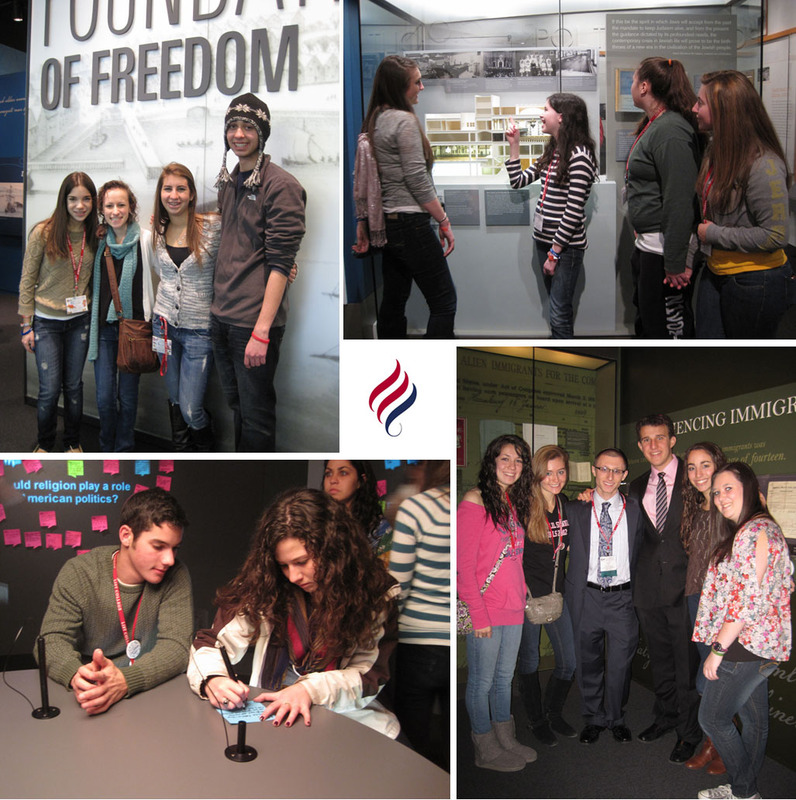 They were in town for the USY International Convention, taking place in Philadelphia. I was in BBYO and well remember the conventions I attended during my winter breaks. I hope these conventioneers enjoyed their visit as much as I enjoyed the conventions I attended and that the entire program is a big success. One of the truly satisfying aspects of Museum work is the opportunity to become the custodians of the precious objects and stories that illuminate our shared Jewish and American history. 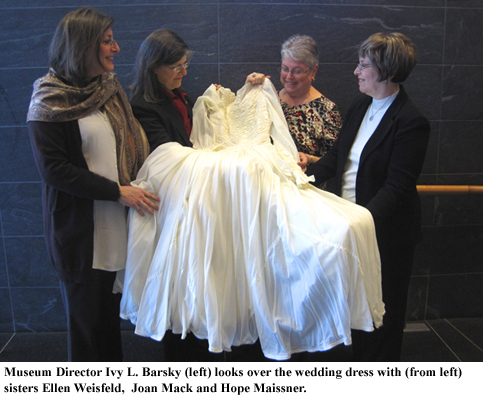 Earlier this week, three lovely sisters, Joan Mack from Wilmington, Del., Hope Maissner from Toronto, Canada and Ellen Weisfeld from Jackson, N.J. came to NMAJH donate a wedding dress and related artifacts to the Museum. It is not the only wedding dress in our collection. What is noteworthy about this dress was that it was made from a parachute used by their father in World War II. 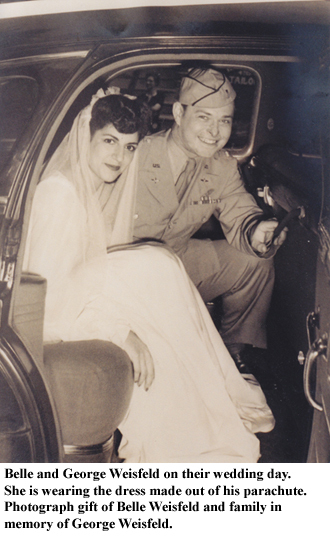 Their father, George Weisfeld, was in the Army Air Corps during the war. As co-pilot, while flying a mission to deliver ammunition to troops in Bastogne during the Battle of the Bulge, their father’s plane was hit and quickly became engulfed in flames. The other pilot told everyone to jump, but George bravely stayed on until the glider filled with ammunition they were towing could safely detach from the tow line. When it detached, he and the pilot jumped from the plane. George was burned severely on his face and neck when he exited the plane through the tail, and had serious scarring and medical issues related to the wounds for many years. After the war, he married Belle Rabinowitz, with whom he had grown up in the Logan neighborhood of Philadelphia. Fabric was scarce and so she had used his parachute from that jump, sewn by a dressmaker friend of the family, as her wedding gown. If it was good enough to save George’s life, surely it was worthy of being married in. We so appreciate the sisters donating this wonderful family treasure, and others, to the Museum.